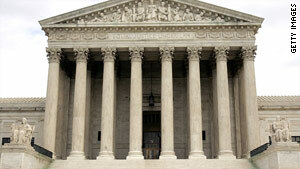 The Supreme Court ruled Thursday in a case pitting homeowners against Florida conservation officials. Washington (CNN) -- Owners of private waterfront property don't have title to beachfront land restored by the state, the U.S. Supreme Court ruled Thursday in a case that pitted resort-town homeowners against Florida conservation officials. In an 8-0 ruling with several concurring opinions, the justices found no constitutional violation occurred when Florida claimed public ownership of beaches created by depositing tons of new sand on eroding shorelines. Homeowners along that beachfront argued that they were deprived of traditional shoreline rights in what amounted to a "judicial taking" of property. Florida officials claimed the replenished land became government land, essentially creating a strip of public beach between the landowners' property and the ocean. Several residents along a nearly 7-mile stretch of reclaimed land near the resort town of Destin had protested, claiming their oceanfront property line extends to the water -- a practice they argued has been endorsed in state courts for over a century. Property rights advocates, supported by a range of conservative and libertarian legal groups, backed the homeowners in the beach dispute. Environmentalists, along with a majority of states and the Obama administration, backed Florida. The Florida Supreme Court had ruled in favor of the state, prompting the high court appeal. "In essence, they rewrote our clients' deeds without going to a court of law to do it," Kent Safriet, the lawyer for the homeowners, told CNN Radio after Thursday's decision. "This is quite a travesty for landowners, because a state can come in, modify your property boundary against your will and without your permission and not pay you any compensation whatsoever." There was no immediate reaction to the decision from Florida officials. The larger constitutional issue was whether courts, by reinterpreting state law, could deprive deed holders of their traditional shoreline rights in what amounted to a "judicial taking" of property. The Constitution mandates "just compensation" by the state when private land is taken for public use. Justice Antonin Scalia and three other conservative justices were prepared to say court decisions can -- in some other cases -- amount to a "taking" of property. But that was not enough to command a majority, leaving the larger issue unresolved and likely to prompt further lawsuits from property owners when state and federal courts, apart from legislatures or the executive branch, uphold eminent domain decisions by the government. The state claims nearly 200 miles -- about a quarter of the state's 825 miles of beaches -- have been restored in an area prone to hurricanes and heavy storms churned up in the Gulf of Mexico and the Atlantic Ocean. And officials argue that since such "emergent" land does not take away property, it is not considered eminent domain, in which the government would have to compensate the private owner. The court concluded that land added to the shore gradually -- a process known as accretion -- would belong to the homeowner. But but new land created by a sudden addition, known as avulsion, "continues to belong to the owner of the seabed," which is the state. "Prior Florida cases suggest the state has the right to fill in submerged land, and that an avulsion created by the state is no different from any other avulsion," Scalia said in delivering the majority opinion. The area along Florida's Panhandle region is known for its dramatic crystal white sands, much of it threatened by the recent oil spill in the Gulf of Mexico. Destin is a popular beach town which calls itself the "world's luckiest fishing village." The homeowners told the court the difference between beachfront and "beach view" -- from an aesthetic and financial point of view -- is tremendous when property values are considered. "It was a wholesale transfer of rights as well as the deed," they argued. The homeowners who sued owned just six of the 448 parcels included in the Destin-area replenishment project, and created a group called Stop the Beach Renourishment, Inc. Local environmental groups and some other homeowners in the neighborhood say the plaintiffs appeared to be "looking a gift horse in the mouth" -- benefiting from the taxpayer-paid restoration project, yet still claiming effective ownership of the artificial beach. Safriet had argued that what had been unhindered private land stretching 200 feet to the water now has become a 75-foot stretch of public beach between the property line and the water's edge. Property rights along the water -- known as littoral ownership -- have long been a tricky matter. In most coastal states, beachfront property is split between the government and private owners. The dividing line has traditionally been the mean high water line, a flexible border depending on the shifting sands and tides. The state usually owns the property seaward of that line. This case has not yet risen to the level of public outcry from the high court's separate 2005 ruling, which said the government had the power under eminent domain to take private homes and give them to private developers, in the name of improving downtrodden neighborhoods. That provoked widespread criticism and led several states to reform their property seizure laws. The retiring Justice John Paul Stevens did not participate in the decision. No explanation has yet been given for his absence, but the 90-year-old justice may have recused himself because he owns seaside property in another part of Florida that will soon undergo an erosion-control project similar to the one in Destin. The case is Stop the Beach Renourishment v. Florida Dept. of Environmental Protection (08-1151). CNN Radio's April Williams contributed to this report.